I don't know why lip oils are most popular in the summer. Maybe because of the sheer wash of color and glossy finish they provide? In my opinion, the best time to wear tinted lip oils is the fall/winter. Matte lipsticks are beautiful, but if your lips are half as dry as mine, you need to take days off regularly! 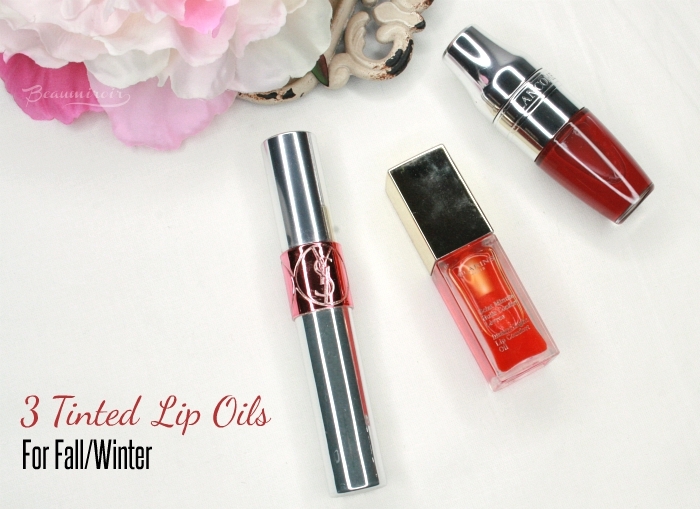 Tinted lip oils are perfect to nourish and repair your lips while giving you a nice touch of color and shine. 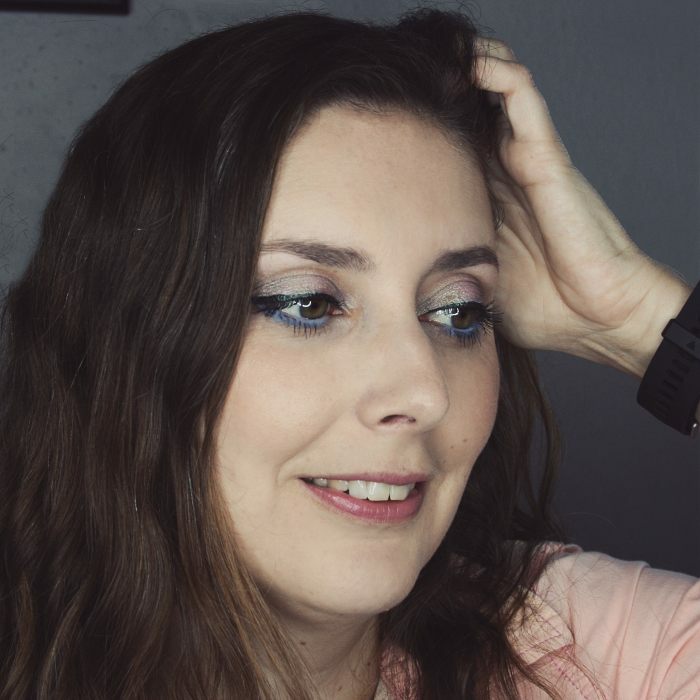 Here are my 3 favorites lip oils by French makeup brands: none of them feel greasy or sticky and they each have something that makes them special! Sorry the tubes don't look pristine, these have been in my purse a lot lately! This one shouldn't come as a surprise if you follow my blog, I've talked about this product quite a few times! The Juicy Shaker wins for cutest packaging, widest range of shades to choose from, and best scents. Each shade has a slightly different scent related to its name, but the fragrances are light and subtle. 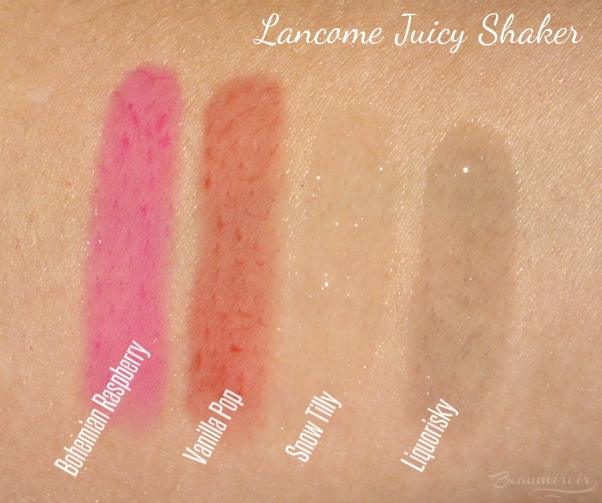 The Juicy Shaker also has the thinnest texture of the three lip oils I selected. It's super easy to apply with the cushiony applicator and it makes my lips feel nicely moisturized. The color payoff goes from almost clear to sheer depending on the shade, so pick a bright or dark one if you want visible color on your lips. Of the 4 shades I have, Vanilla Pop and Bohemian Raspberry provide a good amount of sheer pigment and leave a stain, while Snow Tilly and Liquorisky are fun top coats. What makes it special: cute, playful cocktail shaker packaging, cushiony applicator, a multitude of shades/scents, moisturizing, deeper shades leave a stain. The most expensive of the three, the Tint-in-Oil also has the most high-end packaging with its elegant silver tube. It has the signature mango scent of all YSL lip products - I'm not going to lie, I find it too strong in this product as well as the Volupté Gloss, luckily it doesn't last too long. What's interesting with the Tint-in-Oil is that it applies almost clear, but turns into a deeper, brighter color on the lips after a few minutes. 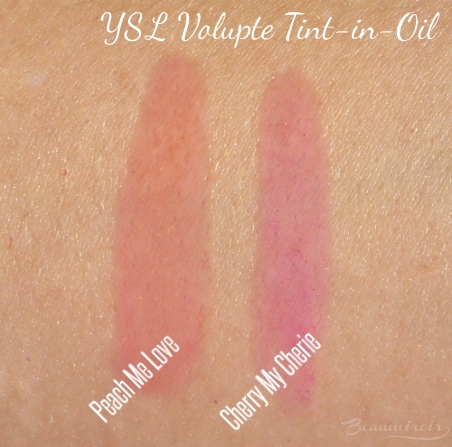 The swatches are not very impressive, but on my lips I get a nice sheer veil of shiny coral with Peach Me Love and cool pink with Cherry My Chérie. It also leaves a stain behind once the glossiness is gone. What makes it special: high-end packaging, lip-shaped applicator, color adapts to your skin, leaves a colorful stain. This is the one to pick if you want a wet-like shine! 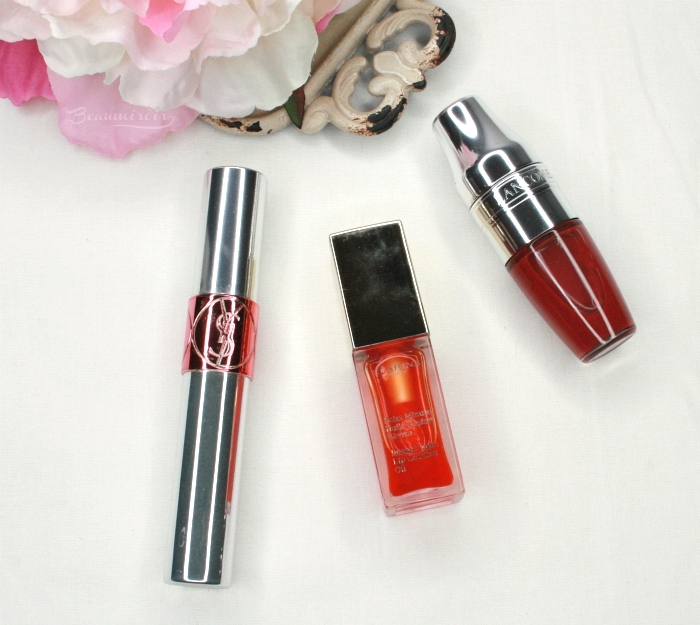 The Lip Comfort Oil is a little heavier than the other two, with a thicker texture. As a result if creates a comfy cushion on top of your lips that feels amazing if you have dry, chapped lips. It almost look like syrup with a highly glossy finish. The wide, paddle-like applicator allows you to coat your lips in one swipe. 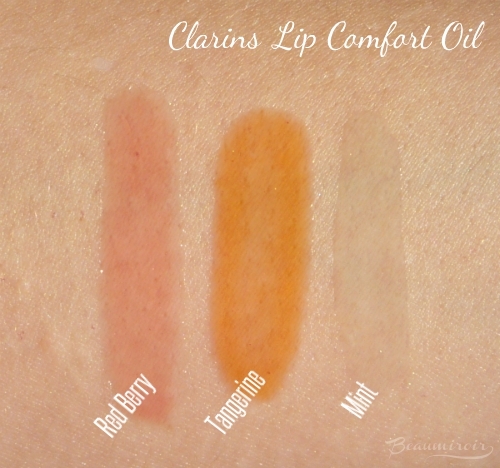 Clarins expanded the shade range for the Lip Comfort Oil so you can now choose from very natural looking ones to a blue with a minty flavor or a gold with shimmer. I have Red Berry that I reviewed a while back, a sample of Mint, and the color adjusting Tangerine. That one is orange in the tube but turns coral on my lips. What makes it special: very comforting and nourishing for dry lips, high shine, wide applicator, some shades adapt to the pH of your lips. 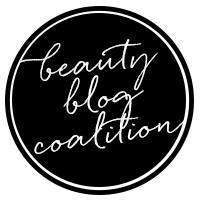 Do you like lip oils? What is your favorite? 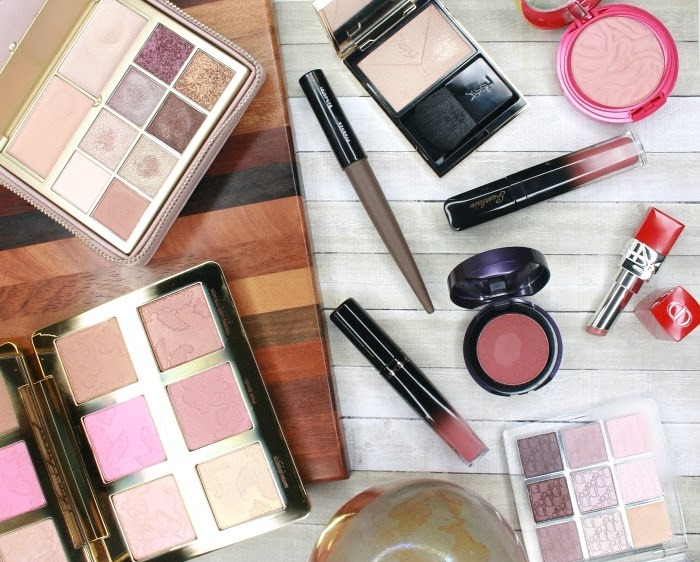 The products featured in this post were all purchased by me. I received no compensation to write this post, which only reflects my personal opinion. This post contains affiliate links. I receive a very small commission when you click on those links, and the money generated covers a small portion of my expenses to purchase products for review. Clicking on those links helps ensure that Beaumiroir continues to publish reviews of new and exciting high end French products - at no cost to you!